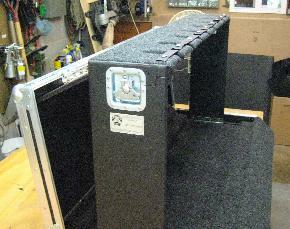 "Custom Cases Built by Musicians for Musicians"
My Newly Designed 8 Guitar Folding Guitar Stand. 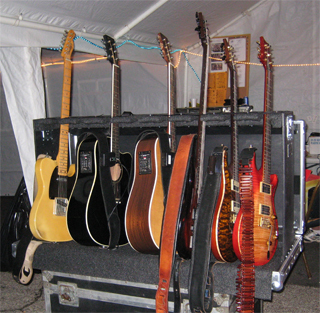 I build them to hold 4,6, or 8 Guitars. I don�t trust any of the website measurements so I will need the exact measurements for each case Length, Depth, and Height. The Height (Remove any wheels!) set on a flat surface and measure from the surface to the top edge of the corner (Don�t Add Handle!) and the Length and Depth measure from the outside edges of the bottom corners at the widest point. 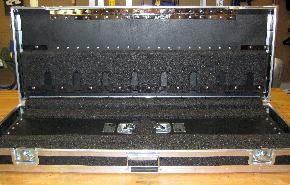 RoadHawg Cases does offer a 90 day Limited Warranty on Factory defects. So don’t roll them off a stage or loading dock, run over them with a truck or bull dozer or set them on the railroad tracks, etc! If you have any problems with our cases just contact me and we’ll work them out. I stand behind my work. Thank You. 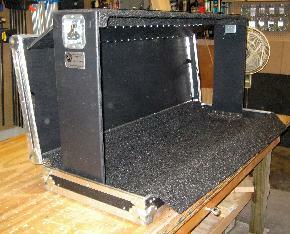 Copyright � 2006 RoadHawg Cases. All Rights Reserved. Designated trademarks and brands are the property of RoadHawg Cases owners. Use of this Web site constitutes acceptance RoadHawg Cases.